The main dress worn by the people of Kerala is mainly traditional in nature though the costumes are to a large extent guided by the geographical conditions of the region. 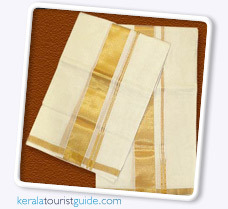 The traditional dress forms are the 'Mundu and Neriathu' (a white piece of cloth with golden zari border symbolising royalty) for men; and 'sari' (a 5-6 metres long piece of cloth embroidered with golden border) with jacket for women. With the changing trends in fashion and designing, the dress codes have changed. A multitude of colours and designs are available today. Men and women today are clad in a variety of dresses. The people have now taken to the northern style of dressing up though the western dresses have also found a lot of acceptance among the masses. is the traditional dress of Hindus in Kerala. About 50 years back Hindu women in Kerala used to wear 'Rowka' with 'Mundu'. Nair women used to cover Rowka with 'Neryathu'. After that they began to use white 'Melmundu' with Rowka. Later Rowka was replaced by Blouse and Melmundu was replacd by 'Kasavu Neryathu'.